Eamonn Boland drove a huge amount of cars in his time as a customer of Dom Buckley Motorsport. In WRC class he drove most of the World specification of Subaru, 05 and 06 Focus’ and a Step 2 Mitsubishi Lancer. We built him 2 Evo 10 Lancers that he used in the World Championship and on some ERC events. 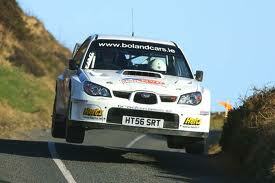 He also drove an R4 Subaru Impreza on selected WRC events. Eamonn had a very succesful career in rallying, winning the Irish Rally Championship in 2008, 2 years after finishing as runner up. He has a number of top 15 WRC finishes and has also scored WRC points.